The JRC spokesman, In The Person Of Cynthia Whyte, in a statement sent via e-mail, yesterday, said a return to armed struggle by ex-militants could threaten oil production and cripple the economy. Whyte said the ex-militants are worried over moves to replace the Special Adviser and Coordinator of the Presidential Amnesty Programme, Brig- Gen Paul Boroh, and hijack the office to settle vested political interests. The JRC also took a swipe at Niger Deltans in President Muhammadu Buhari’s, accusing them of not having the interests of the people at heart. “If you seek peace in the Niger Delta, it must be worked for. We will never be cowed by the intentions of the ungodly. We have worked hard to keep the peace. Nothing stops us at this moment from breaking everything into pieces. We reject the antics of these failed, disgruntled and unpopular politicians and we declare that we will never be part of any engagement that includes them. It will never happen. The amnesty programme is not a parade ground where retired military officers can be quickly conscripted to command former combatants of the Niger Delta struggle. Meanwhile, the Pan Niger Delta Youth Forum (PANDYF) has appealed to members of the Niger Delta Avengers (NDA) to shelve a proposed attack on oil facilities and installations, in protest against the Federal Government’s perceived attitude to problems of the Niger Delta. PANDYF leaders made this call after a meeting in Yenagoa, During The weekend. PANDYF leader, Richard Akinaka who explained issues discussed at the meeting said the region has gone beyond the phase of using violence to drive home its point and also, noted that what the region needs is to engage government in an intellectual dialogue that would bring desired results. 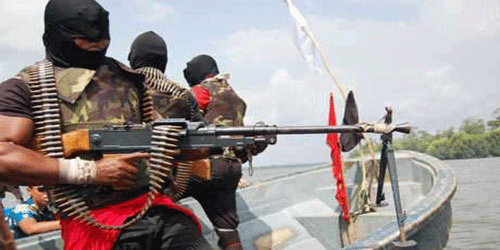 0 responses on "Ex-Militants May Dump Amnesty Program, Return Armed Struggle"